Only a handful of cruise ships can truly be classed as 5-star, luxury vessels; the Regent Seven Seas Cruises fleet has been highly successful in building such a reputation by offering unrivalled, first-class cruising as it was meant to be - a world where everything is included, without exception and without compromise. 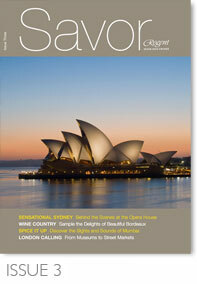 Twice a year (May and November), Guests enjoy the latest issue of SAVOR magazine in the comfort of their suites. Fabulous visuals and entertaining editorials mirror their interests in culture, the arts, gastronomy and of course travel.